I know, I know. I'm the same person who wrote about my problem hoarding traditions, and we do still get to our fair share of holiday parades, Christmas tree lightings, and Santa visits...but I've realized that there are certain things that are really important to our family and connect us to the community we choose to live our lives in so we've been trying to focus on those. This post is part of a blog hop with some other local bloggers. Be sure to click through their links at the end of this post for more #MaritimeChristmas fun! Here are our five favourite Halifax Christmas family traditions. Halifax is home to a LOT of parks and wildlife and many of the local critters are scrounging around for nourishing food all winter long. When I taught preschool I came across this book called Night Tree by Eve Bunting and Miss M received this book for her first Christmas (you can purchase it at the affiliate link here). The gist of the story is that the family spends some time leading up to Christmas making edible ornaments for wild animals. Then they go out Christmas Eve and decorate a tree with these ornaments. We used to drive to one of the local trails and take a walk in the woods and do this (though check current regulations to make sure you're allowed to feed the animals where you go! ), but in the home we live in now there is a wooded area behind the house full of deer, rabbits, raccoons, and squirrels. We've found a special tree and every year at Christmas we take a family walk back on the property and decorate our tree. Then we go back a few days later and the children delight in seeing the leftover orange peels and picked clean pine cones. If you'd like to do this, I did a post about how to make ornaments for wild animals here. You could also make this beautiful frozen treat wreath for birds and hang it outside your home! Gingerbread and Atlantic Canada go hand-in-hand in my mind. As long as I can remember my Mom has made graham cracker gingerbread houses every year. My brothers and I would load them up with royal icing and then dot them with candy (and sneak in some icing and candy ourselves, of course). Sometimes we'd take our time and carefully design a beautiful structure, other times we'd just try to cram as much candy as possible onto our house. 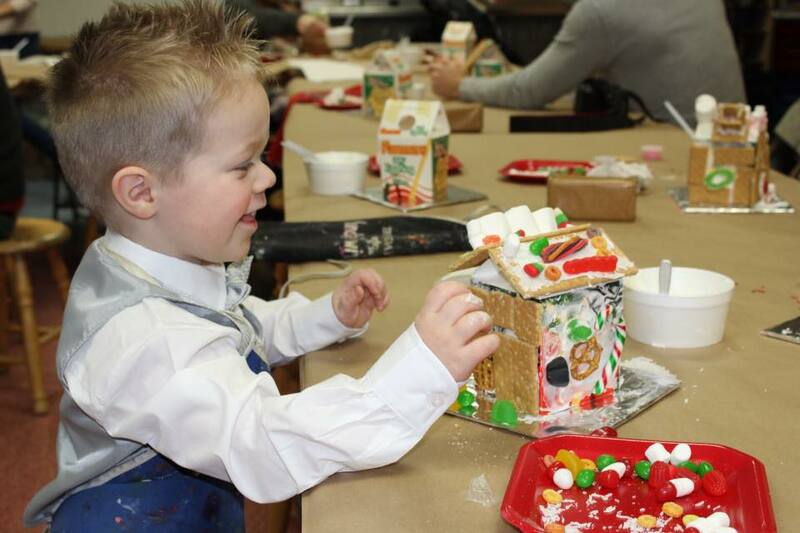 This year we added a new tradition and visited the Art Gallery of Nova Scotia for their annual Gingerbread Sunday. They supplied all the goodies and inspiration in the form of Maud Lewis's painted house and the children adored it. There's even a sweet Christmas scene (see the image at the top of the post) to snap a photo of your kids or the whole family at the front of the gallery. We featured the board book Maud Lewis 1 2 3 in an Itsy Bitsy Nimbus Book Club and in the post we made Maud inspired Christmas cards and Christmas cookies (you can learn how to make your own by clicking here). I actually started this tradition LONG before I met my husband or had my children. Every year I used to visit the Christmas By the Sea shop on Hollis Street and chose a special ornament (or two) that symbolized something significant about that year. Now that the shop is gone I shop at the many local gift shops and craft fairs in the city as they have wonderful, locally inspired collections of ornaments like this one of my old pal Woody the Talking Christmas Tree that I sent to my Secret Santa recipient this year. I also pick one up from anywhere we have travelled that year so we'll be adding a PEI and Cape Breton ornament to the tree this year. Now I also pick one out for the children and gift it to them to add to the tree while we are decorating. I write the year and their initials somewhere on it with a paint pen. It's so fun to go through the ornaments while decorating the tree every year and share the memories about why each was chosen. When the children grow up and move out (*sob*) they can take their special collection of memories along with them. This tradition started last year when Miss M was five years old. My mom bought the three of us tickets to see The Nutcracker Ballet with Symphony Nova Scotia and Mermaid Imperial Theatre. We dressed in our Christmas best and went together. It was MAGICAL. The show is filled with local dancers and it's likely you know someone performing. Our friend's daughter has been in it both years we've gone so it's always fun for us to play "Spot Mackenzie" during the show! We listened to the music and read the book ahead of time to familiarize her with the story, which definitely helped her attention span. I recommend getting your hands on a copy of the locally written and illustrated book Clara's Gifts. The Symphony NS story is a little different from some of the other versions of The Nutcracker and it is great to help kids understand the flow of the show. The first Christmas we celebrated in the house we call home now, we had a two year old and a three month old. We'd moved in June while I was pregnant with Mr M and our realtor, Paula Langille (she's the BEST and her family was even featured in one of my Raising Haligonians profiles here earlier this year), gave us our first ever bottle of Nova 7 (it's from a winery in Wolfville in case you haven't tried it - so delicious) to celebrate with once the baby was born. We saved it until Christmas Eve and once the children were nestled in bed and all the morning prep had been done, my husband and I sat on the floor of our living room and POUNDED BACK, er, I mean sipped elegantly, that bottle of sparkling wine, paired with some cranberry goat cheese and crackers. It was such a moment of peace and allowed us to reflect on the year and connect with each other before the craziness of full-on Christmas began. We decided to treat ourselves to that moment every year and now we both look forward to that moment when we crack open the Nova 7 and BREATHE. Tip: Another excellent option is Jost's Selkie (it's also a delicious sparkling Nova Scotia wine). What are your Maritime Christmas traditions?